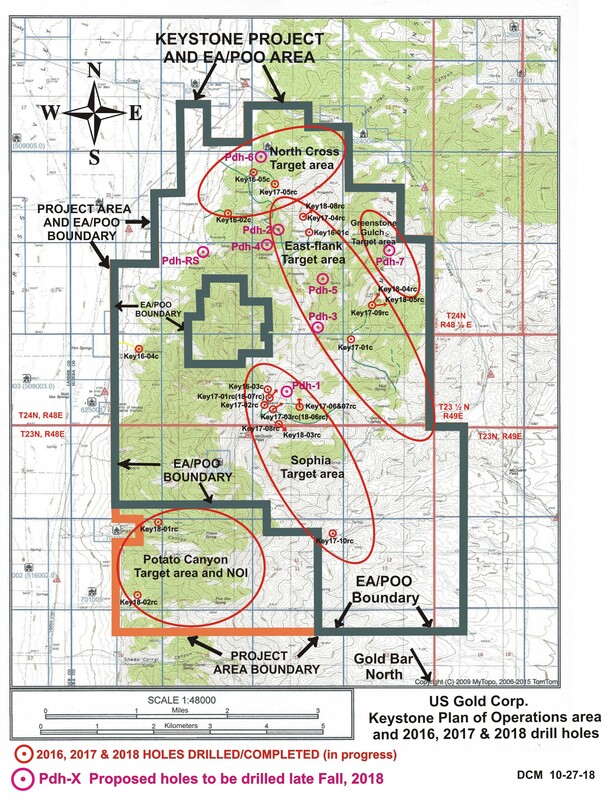 ELKO, NV, November 6, 2018 — U.S. Gold Corp. (NASDAQ: USAU - http://www.commodity-tv.net/c/search_adv/?v=298583), a gold exploration and development company, is pleased to announce the commencement of the Autumn 2018 drilling program at its 20 square mile, Keystone project, in Nevada’s Cortez Trend. The program is expected to test several drill targets in areas previously inaccessible with a drill because of permitting limitations. Identification and qualification of these targets has been in progress since the onset of the exploration program almost 3 years ago. This targeting effort has included iterative detailed gravity surveys, detailed geological mapping and associated prospecting, rock sampling and detailed gridded soil surveys, in addition to prior scout hole drilling. 2016-2018 scout-type drill holes, comprised of 22 individual holes drilled from 15 total drill sites, have importantly added to the knowledge of, and geological understandings of the permissive lithologies and favorable stratigraphy of the project. Scout drilling has also encountered thick sections of permissive rock, including Horse Canyon, Wenban, and Roberts Mountains Formations (similar host rock packages to the sizeable deposits at the north of the Cortez Trend), hosting anomalous to multiple gram gold intervals associated with very anomalous and thick intervals of pathfinder metals. The Autumn 2018 drilling program will now provide a first test to some of the most compelling targets on the Keystone project. Dave Mathewson, U.S. Gold Corp.’s Vice President of Exploration, states: “We are very pleased to finally move forward with the assessment of these Keystone drill targets. These targets have been qualified and prioritized by our experienced exploration team which includes Ken Coleman, Project Geologist and Brion Theriault, Senior Consulting Geologist. A reverse circulation drill will be employed to drill the holes, up to 2000 feet of depth each, into these targets. Pdh-1: Priority #1 - Sophia target test, approximately 1000 feet north of previous drill holes, of Carlin-style gold mineralization in Wenban at the intersection of a N35+/-W and N60W fault zone with strongly anomalous gold and pathfinder metals in surface soils and rock chip samples. This intersection is also coincident with a pronounced gravity low feature. Pdh-2: East flank target test of several permissive horizons in Wenban and upper Roberts Mountains Formations in the footwall of N20-25W trending structure and antiform intersected by dike-filled N40-60E faults. A major mineralized structure is indicated by a sharp gravity gradient and strongly anomalous gold and pathfinder metals in soils and rocks. Historic shallow holes in this area encountered gold intercepts > 3-gram gold/ton near surface. Pdh-3: East Flank target test of Wenban beneath relatively thin veneer of altered upper-plate at the intersection on multiple N70W, N25-30W, and N40E striking dike-filled structures. The surface is characterized by highly anomalous pathfinder metals and moderate gold in soils and some rock samples. Pdh-4: This hole will test an untested strong induced polarization chargeability anomaly subjacent to the historic mined Keystone skarn-hosted base and precious metals deposit. Surface samples in this area include the highest gold samples, i.e. > 20-gram gold/ton, ever obtained in the district. Pdh-5: East Flank target zone: this hole will test potential Carlin-style mineralization within Wenban at the intersection of N30W, N20E, and N50E faults within a strong N20-25W trending gravity linear zone. Surface soils and rock samples are moderately anomalous in gold and pathfinder metals. Pdh-6: North Cross target: this hole will test potential Carlin-style mineralization in Wenban limestone beneath thin altered upper-plate and volcanic cover at the intersection of N30E and N60W trending, partially dike-filled faults. This site is also located at the intersection of broad N60W trending hills and N25-25W gravity linears. Pdh-7: This hole will test the potential for Carlin-style mineralization in Cambrian upper-plate at a location where a silicified dacite dike crops out at the surface. Argillized greenstones in this area contain goethite-barite veinlets. Pdh-RS: This hole is a remote-sensing identified target opportunity located west of the historic Keystone mine in altered Wenban Formation. Forward-looking statements in this press release and all other statements that are not historical facts are made under the safe harbor provisions of the Private Securities Litigation Reform Act of 1995, including the planned drilling program, the anticipated results of the program and future work programs. These statements involve factors, risks, and uncertainties that may cause actual results in future periods to differ materially from such statements. There are a number of factors that could cause actual events to differ materially from those indicated by such forward-looking statements. These factors include, but are not limited to, risks arising from: changes in the price of gold and mining industry cost inputs, environmental and regulatory risks, risks faced by junior companies generally engaged in exploration activities, and other factors described in the Company’s most recent Annual Report on Form 10-K, Quarterly Reports on Form 10-Q, and Current Reports on Form 8-K filed with the Securities and Exchange Commission, which can be reviewed at www.sec.gov. We make no representation or warranty that the information contained herein is complete and accurate, and we have no duty to correct or update any information contained herein.